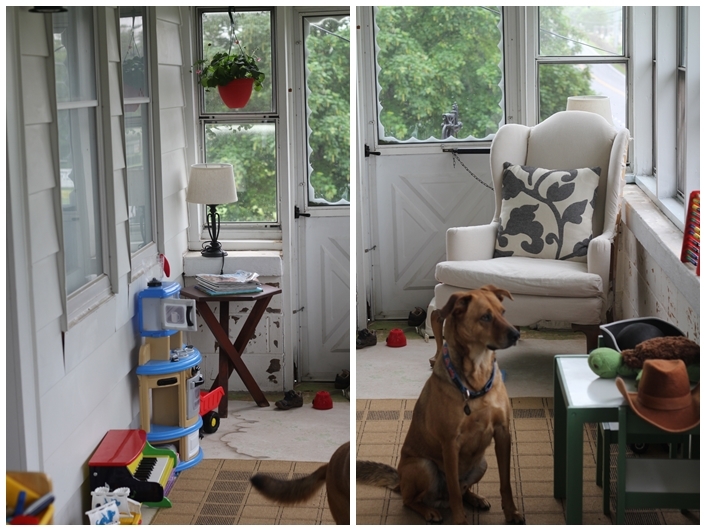 Contrary to blog updates, we have actually gotten a lot done around the house lately, but they are things that don't make a huge impact in a blog post. Things like - finally hooking up the washer and dryer, slowly patching holes in the plaster, patching holes in the window trim, etc. All of those things add up to a whole lot of work, but not a lot of impact (yet). As you can see, it is a very functional space, but not a very pretty one. And since this room is the room that is right off of the main living space, I would like it to look a bit nicer, ya know?! For reference, the brown door that you have seen in a few of the earlier living room posts is the door that leads to this room. You can see it here in this picture of Matt and his friend Nelson removing that awful glue (it's gone now by the way....YAAAAY!). I think I am going to continue the diamond floor that I painted in the mudroom. 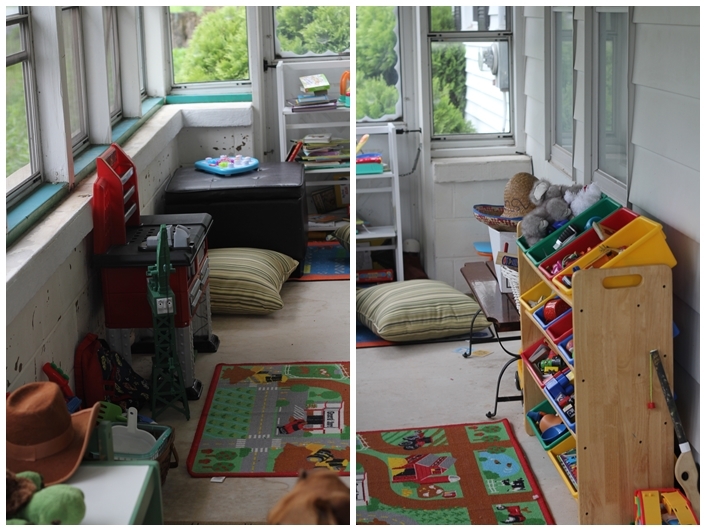 The mudroom and the playroom are exactly opposite each other, and our house is pretty small, so as much as I would like to do something else entirely on the floor - I want the house to flow as much as possible, and the floors should give that continuity. Any sort of seating out here is tough, because it is a long narrow room (6.5 feet x24 feet), so the Ikea shelves turned cubbies and benches should be a good fit out here. Plus low storage is good for the boys, who tend to ignore anything more than three feet off the ground. I love the idea of the alphabet on the storage boxes, but I highly doubt we will have 26 boxes out there! Maybe numbers? Animals? On the other side of the room I would like to make it more of an adult space, maybe some patio type furniture for us to hang out on, because this room is a nice place to be during both the day and night due to all of those wonderful windows! Now I just have to make the time to set these plans in action! What would you do with this space? Love these plans! For the adult seating area, I love the idea of a little built in daybed across the whole width of the space. Oh thanks!!! I will update that link! That is my main frustration with pinterest - is all the links that dont give the proper credit! I'm excited to see the final product as well. I am so envious of those walls of windows! 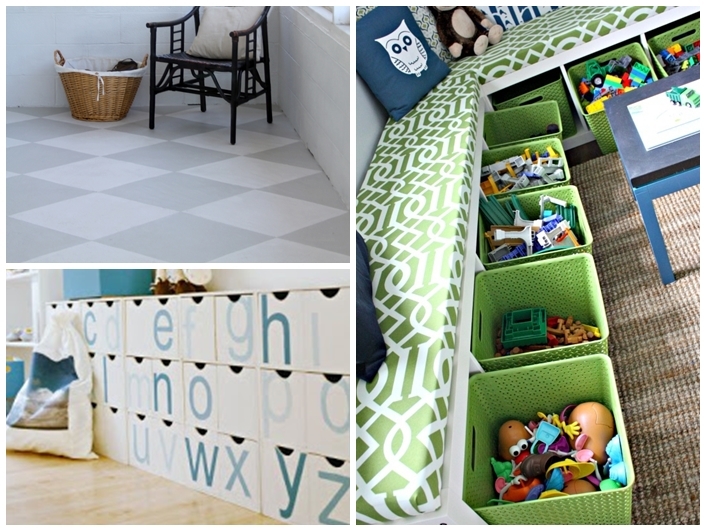 It's going to be a fabulous playroom when you're all done, I'm sure! Love the inspirations! Such a great space. Love the inspiration! I think bench seats with storage would be awesome out there! And I totally agree with you on the floor! Great idea!